Gidon Markowitsch Kremer was born on 27th of February 1947 in Riga, Latvia to German-Jewish parents. He has established a worldwide reputation as one of the most original and compelling classical artists of his generation, praised for his high degree of individualism, his rejection of the well-trodden paths of interpretation, and his search for new possibilities. Kremer began studying music at the age of four with his father and grandfather, who were both distinguished, professional violinists. At the age of seven, he entered the Riga Music School. Kremer began studying music at the age of four with his father and grandfather, who were both distinguished, professional violinists. At the age of seven, he entered the Riga Music School. At sixteen he was awarded the First Prize of the Latvian Republic and two years later he began his studies with David Oistrakh at the Moscow Conservatory. He went on to win prestigious awards including the 1976 Queen Elizabeth Competition and the First Prize in both the Paganini and Tchaikovsky International Competitions. 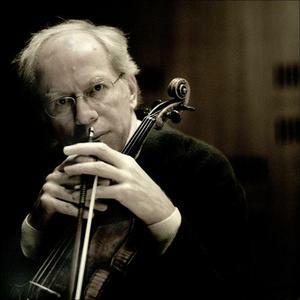 Gidon Kremer's repertoire is unusually extensive, encompassing all of the standard classical and romantic violin works, as well as music by 20th century masters such as Henze, Berg and Stockhausen. He also championed the works of living Russian and Eastern European composers and has performed many important new compositions, several of them dedicated to him. He has become associated with such diverse composers as Alfred Schnittke, Arvo P?rt, Giya Kancheli, Sofia Gubaidulina, Valentin Silvestrov, Luigi Nono, Aribert Reimann, Peteris Vasks, John Adams and Astor Piazzolla, bringing their music to audiences in a way that respects tradition yet remains contemporary. It would be fair to say that no other soloist of his international stature has done as much for contemporary composers in the past 30 years. An exceptionally prolific recording artist, Gidon Kremer has made more than 100 albums, many of which brought him prestigious international awards and prizes in recognition of his exceptional interpretative powers. These include the "Grand prix du Disque," "Deutscher Schallplattenpreis," the "Ernst-von-Siemens Musikpreis," the "Bundesverdienstkreuz," the "Premio dell' Accademia Musicale Chigiana," the "Triumph Prize 2000" (Moscow) and in 2001 the "Unesco Prize." In February 2002 he and Kremerata Baltica were awarded with the Grammy for their latest Nonesuch recording "After Mozart" in the category "Best Small Ensemble Performance." In 1981 Gidon Kremer founded Lockenhaus, an intimate chamber music festival that continues to take place every summer in Austria. For two years from 1997 to 1998, Gidon Kremer took over the artistic leadership of the Gstaad Festival from its founder, Sir Yehudi Menuhin. In 1997, he founded Kremerata Baltica chamber orchestra to foster the talent of outstanding young musicians from the three Baltic States. Since then, Mr. Kremer has been touring extensively with the orchestra, appearing at the world's most prestigious festivals and concert halls. He has also recorded a number of CDs with the orchestra for Teldec and Nonesuch, the first releases featuring music by Peteris Vasks and Astor Piazzolla, the latest recording released on Nonesuch being a collection of works under the theme "Happy Birthday." In 2002 Gidon Kremer became the artist director of a new festival in Basel, Switzerland, called "les mus?iques." Gidon Kremer is also a writer. He is the author of three books in German that reflect his artistic philosophy: Kindheitssplitter, Oase Lockenhaus. 15 Jahre Kammermusikfest KREMERATA MUSICA 1981 - 1996, and Obert?ne. Kindheitssplitter has been translated in Russian, Latvian, French and Japanese.